Investigators were working diligently to piece together the string of bizarre attacks, but had no solid leads. 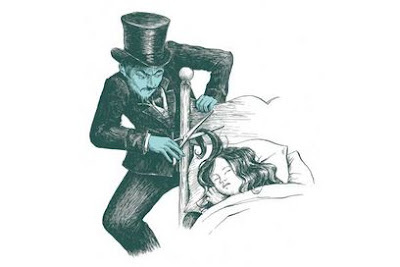 A week after the first attack, the Phantom Barber struck the home of David G. Peattie, shearing his daughter Carol’s hair. The parents found a bare footprint near the window. The following Friday, the attacks became violent: the Phantom allegedly entered the house of Mr. and Mrs. ST Heidelberg, and proceeded to beat them with an iron bar. The final attack happened on a Sunday, two weeks later. The Phantom clipped a two inch lock of hair from the head of Mrs. RR Taylor. Mrs. Taylor reported a sickening smell and something being pressed to her face, which authorities assumed to be a chloroform rag. All told, about ten homes were broken into during the Phantom Barber’s reign of terror. In August, the police apprehended a suspect that they concluded was the Phantom Barber. His name was William Dolan, a 57 year old German chemist with reported German sympathies and a grudge against the Heidelbergs. Mr. Heidelberg’s father was a local judge who had refused to lower Dolan’s bail on a trespassing charge several months before. Dolan was charged with the attempted murder of the Heidelbergs, but curiously he was never charged with one of the Phantom Barber attacks, despite the FBI finding a bundle of human hair behind his house, some of which belonged to Carol Peattrie, one of the Barber’s victim. However, Dolan had always denied being the Phantom Barber and many in the area believed that police had the wrong man. Though no attacks occurred after Dolan’s arrest, some believe that the Phantom Barber moved on to another area. It isn’t clear whether Dolan really was the Barber though. His attack was uncharacteristically violent compared to the Barber’s attacks. It could be argued that the Barber attacks were practice runs leading up to the assault on the Heidelberg’s, but if that were the case, why do another Barber-style attack after the Heidelberg assault? Also, if they were practice runs, why cut hair? It sounds like something sexually motivated, a hair fetish perhaps. If that were the case and Dolan were the assailant, why keep his prizes in the back yard? Also, it doesn’t seem that the footprint in Carol Peattrie’s room was ever analyzed, a definite oversight on the part of the police.